Matt and I are thinking of repainting the den. It needs it, if only for the fact that whomever painted in the past didn't properly prep the faux wood paneling and the paint is peeling in places. The problem is, Matt and I are both incredibly opinionated, very stubborn, and prefer two completely different palettes. 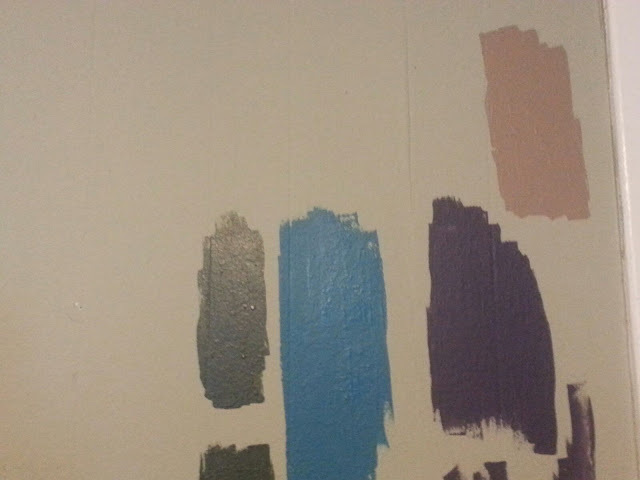 Here's a selection of four possible colors we agreed on after about 45 minutes at the Home Depot. I like three of them. Matt likes one. Hint: his one isn't one of my three. We're going back tonight for two more samples. One is a color I liked at the store (and have picked out at random the last three times I was at Home Depot). The other is a color he likes and I would agree to if the sample looks OK on the walls.